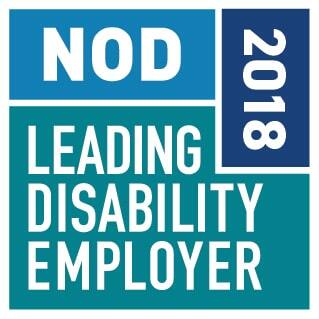 Falls Church, VA (September 25, 2018) – The National Organization on Disability (NOD) today announced fifty-two organizations that have been named 2018 NOD Leading Disability Employers™. Now in its third year, the NOD Leading Disability Employer seal recognizes companies that demonstrate exemplary employment practices for people with disabilities. This annual recognition is designed to applaud those organizations that are leading the way in disability hiring and to encourage additional companies to tap into the many benefits of hiring talent with disabilities, including strong consumer preference for companies that employ individuals with disabilities and greater employee engagement across the workforce. View the winners’ video and learn more. To be considered for the 2019 NOD Leading Disability Employer seal, companies must complete the Disability Employment Tracker during the qualifying window. Sign up to be notified when the 2019 Disability Employment Tracker opens this October. The Disability Employment Tracker™ was developed by NOD, in partnership with the National Business and Disability Council (NBDC).